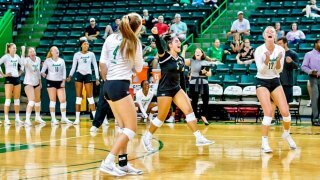 TUSCALOOSA, Ala. – The Marshall volleyball team handed the Georgia Tech Yellow Jackets its second loss of the season in four sets (27-25, 19-25, 25-20, 25-23) Saturday afternoon at the Bama Bash. Freshman Gabrielle Coulter was named to the All-Tournament Team. "What a great birthday gift for (volunteer assistant coach) Jason (Morris)," Herd head coach Mitch Jacobssaid. "He spent a lot of time scouting Georgia Tech and put together a great game plan with the staff and the kids executed." The Thundering Herd improve to 5-6 while the Yellow Jackets fall to 9-2. "I'm so proud of the way our team played today," coach Jacobs said. "It was a complete team effort and win. Georgia Tech is legit, not to mention that they already have two wins against teams that beat us. Our kids are growing up fast and it's so exciting to see how happy they are for each other's success, no matter who is called upon to play. "Our service and ball control was on point and we knew it would have to be. Defensively we seemed to put things together in bunches and allowed our team to gain momentum in each of the sets we took. Coulter contributed 107 assists, 11 kills and 26 digs during the tournament. In the victory over the Yellow Jackets the freshman recorded 42 assists, seven kills and 13 digs. "Gabby Coulter played her best match today of her young career," coach Jacobs said. "She's been getting better all season, but today she was outstanding. To beat Georgia Tech we knew show would have to run our hitter in many different slots and that's just not easy for a young player to do and she was great. "Having so many good opportunities with our passing game so good, Gabby was able to take some chances as well as be offensive herself. Her going after some kills just brings more though for our opponent." Marshall came thundering back after trailing 7-1 and 9-3 in the first set. The Herd went on an 8-0 run to take an 11-9 lead and force a Georgia Tech timeout. It was a back-and-forth match the rest of the way with five ties and the lead changing hands two more times. The Yellow Jackets scored two straight to tie the set at 24-24 and then tied it again at 25-25. A kill by senior Lauren Mattmuller and an error by Georgia Tech gave the Herd the set one win. Marshall fell behind early in the second set, 3-0, but found the fight and got back into it tying the set at 5-5. Georgia Tech climbed out to a five-point lead at 15-10, which then Marshall erased with four-straight points to trail by one and force another Yellow Jackets timeout. Georgia Tech was able to pull away after the timeout and took the second set, 25-19. With the match tied at 1-1, Georgia Tech looked like it was beginning to take control of the third set with the score 14-10. However, Marshall went on another run (6-1) and took the lead at 16-15. The Yellow Jackets took back the lead at 17-16, but then kills by senior Shelby Conley, Mattmuller and redshirt sophomore Ciara Debell, along with two Georgia Tech errors gave the Herd a four-point lead, 21-17. Marshall held on through the rest of the set as back-to-back kills by Debell and freshman Sarah Schank finished off the set and gave the Herd a 2-1 lead. "Having Ciara back on the court today and energized draws a lot of attention," coach Jacobs said. "And that allowed others to really get some open swings. Neither team backed down in the fourth set as there were seven lead changes and ten ties before Marshall took the lead for good at 16-15 with a kill by Mattmuller. Georgia Tech closed it to a one-point gap at 19-18, 21-20, 23-22 and 24-23. However a kill by Coulter closed out the match and gave the Herd the four-set victory. "And coming down the stretch in set four I believe our service game and defense really made the difference," coach Jacobs added. Debell led Marshall with 16 kills. Mattmuller (9), Conley (8), freshman Mion Weldon (7), G. Coulter (7) and freshman Joelle Coulter (6) all contributed six or more. "Shelby, Lolo (Mattmuller) and Mion delivered with so many big swings throughout," coach Jacobs said. "Mion just keeps getting better and Lolo is so steady offensively. We are starting to get it and it's just so much fun to be apart of this team's growth." Junior Amber Weber led the Herd again on the defensive side with 22 digs. She now has 182 for the year. "Amber was incredible in the five zone," coach Jacobs said of his junior. Their attackers go after that area of the court a lot and Amber shut it down. Making their offense adjust. Marshall closed out the Bama Bash with a record of 1-2, losing to No. 28 Alabama and Northern Illinois before taking the win over Georgia Tech. The Herd hits the road for its final early season tournament with a trip up to Bowling Green, Ohio, Sept. 13-15. Marshall will take on Bowling Green (Sept. 13), Nicholls State (Sept. 14) and IUPUI (Sept. 15). The Herd's next home match is set for Friday, Sept. 21 against Charlotte to begin Conference USA action.